Do You Have a Question about how to make your home safe, healthy and energy efficient? Ask us! What can you do as a renter if you have a health and safety hazard in your home? In most states, landlords are required to keep properties safe, healthy and well-maintained, by local and/or state laws called 'property maintenance codes'. If you rent your home and have a health and safety hazard (it could be chipping paint, a leak or a hole in the floor, for example), reach out to your landlord in writing to ask that it is fixed (text messages or emails are fine). If the landlord doesn't fix the problem after several requests, reach out to your local housing code enforcement department or health department to ask for an inspection. It can be scary to report your landlord for problems in your home, especially if you're behind on the rent or have a legal or immigration issue. Your local tenants' right or legal services organization can help. Contact these organizations to learn about your rights, in case your landlord doesn't fix the problem and/or tries to evict you. Many states and towns have laws protecting tenants from eviction when there is a health or safety hazard in the home. You may also want to save your rent, and put it into an account instead of paying your landlord. This is called 'escrow'. Your tenants' rights or legal services organization can help you figure out if your city or state has rent escrow, and if you should use it in your case. Once the problem is fixed, a judge may order that some or all of the rent you saved be paid to your landlord. Most importantly, don't give up! You and your family deserve a healthy, safe home and free resources are out there to help you work with your landlord. Is radon equally dangerous for everyone or more dangerous for children? Radon is the leading cause of lung cancer among nonsmokers. Children are at greater risk for lung cancer from radon exposure because their lungs are smaller and still developing. Radon decays into radioactive particles that can get trapped in your lungs, causing tissue damage that ultimately leads to lung cancer. Radon is also increases the risk of lung cancer in smokers because their lungs are already compromised. Is radon a concern in newer homes? Yes. Radon can enter a home through cracks and holes in the foundation, floors and walls including construction joints, gaps in suspended floors and around service pipes, wall cavities and the water supply. According to the EPA, nearly one out of every 15 homes in the U.S. is estimated to have elevated radon levels. Radon is measured in picocuries per liter of air (pCi/L). Purchase a short term test that includes lab results to measure the levels in your home. If the lab results reveal a level of 4 pCi/L or higher, follow up with a long-term test. If the average results are 4 pCi/L or higher, you will need to hire a qualified contractor to install a radon mitigation system. Kits are available online or at your local hardware store. Local health departments often offer free test kits. Because radon levels can fluctuate, it's a good idea to test your home once a year, alternating the season in which you test. Radon is a radioactive gas found in soil. It produced by the natural decay of uranium. Radon travels up through the ground and into the air. It can easily pass through the foundation of your home through cracks and holes. The highest risk for radon exposure is inside your home because the walls trap the gas and it builds to higher concentrations. It can be found anywhere, but there are certain parts of the U.S. that have higher levels. What levels of carbon monoxide are dangerous? The presence of carbon monoxide means you are breathing in less oxygen. Health effects can be chronic or acute. Effects also depend on the individual's age and health. Concentrations are measured in parts per million (ppm). A home with fuel burning appliances will often have regular levels below 8 ppm. When these levels are higher than 8 ppm, one of the appliances may be malfunctioning. Exposure up to 70 ppm will not cause acute effects, but over time may lead to chronic headaches, fatigue, chest pain and nausea, especially in the elderly or those with compromised immune systems. Many people will not experience symptoms at levels below 70 ppm. When CO levels are above 70 ppm, these symptoms will become noticeable or more severe. Levels above 150 ppm will cause a very dangerous condition called acute CO poisoning. Acute CO poisoning leads to dizziness, disorientation, loss of consciousness (passing out) and even death. Most store-bought alarms will sound after one hour of reading 70 ppm. When a CO alarm sounds, leave the home immediately and dial 911 from outside. Do I need a carbon monoxide detector on every floor or just in the basement? It's ideal to have a CO detector on every floor of your home. Placement is very important--detectors should be installed near bedrooms so that sleeping occupants will hear the alarm. Do not install detectors near the bathroom or any other areas that produce moisture. Follow the manufacturer's instructions to ensure proper placement. Test the alarm every six months and replace the batteries or unit as needed. The average life of a CO detector is seven years. What is carbon monoxide and where does it come from? Carbon monoxide is (CO) an odorless, poisonous gas produced when fuels like natural gas, propane, oil, kerosene, coal, charcoal and wood do not obtain complete combustion. This could be caused by a malfunctioning appliance, debris or dirt clogging the mechanism or when an appliance does not receive sufficient air. Anything that burns or any appliance that uses these fuels produces CO. It is important to have your appliances inspected and cleaned twice a year to prevent incomplete combustion. To ensure your appliances receive enough air, do not places objects close to appliances like water heaters or furnaces, especially if these appliances are already enclosed in a small closet. How much energy does unplugging electronics like televisions and phone chargers really save? When your electronics are powered off, but still plugged into the electrical out, energy is still being consumed. These "energy vampires" can become expensive, especially for a family with a lot of handheld devices, gaming consoles and multiple televisions. Unplugging items after each use may seem tedious, but the savings can add up. The average home would save $150 a year by doing so. For entertainment centers or other areas where you have a lot of plugs, use a smart power strip. This way you can "unplug" electronics with the flick of a switch. Is there a certain kilowatt hour figure that is considered to be energy efficient? Every home is different. The size and age of your home, as well as the appliances inside are all contributing factors to the energy you use. To find out how energy efficient your home is, hire a contractor or access your local weatherization assistance program (WAP) provider to conduct a home energy audit. The energy auditor will identify ways to improve energy efficiency in your home, like upgrading to energy efficient appliances, switching to LED light bulbs, investing in insulation, installing a programmable thermostat and simply turning down the temperature on your water heater. What temperature would you recommend setting your thermostat to when no one is in the home during the day, both in the winter and summer? Comfortable indoor temperatures are 68 in the winter and 77 in the summer. While you're away for more than a few hours, set the thermostat 2-3 degrees cooler in the winter and warmer in the summer. If you are away on vacation in the winter, leave the thermostat at 60, to avoid frozen pipes. While away on summer vacation, leave thermostat at 80 to avoid increased humidity, which can cause mold growth and warp the wood in the home. How can I get fresh air into my home in the winter other than open a window? Your home will get fresh air in the colder months by having a good HVAC system, changing your air filters regularly, installing proper mechanical ventilation in your bathroom and kitchen. Also, do not smoke in or near the home, and keep your home clean with a HEPA vacuum and VOC-free cleaners. Keeping all of the interior doors inside your home open will also help the air to flow freely from room to room. Assuming you leave your house once or twice a day, you'd be amazed how much fresh air can flow through an open door, even if only for a few seconds. My home has a lot of windows and it gets cold in the winter. What’s the best way to keep heat in? The cheapest and safest method is to seal up your windows and doors using weather stripping, like foam tape or a metal-v strip, on the top and bottom of the window where it meets the sash. Do not seal your windows with plastic, because that can cause mold growth or wood rot if moisture is trapped underneath. The draft you feel may not be from the windows alone, it could also be a sign of poor insulation. You should also check the exterior and interior of your home and seal any gaps, cracks or holes with caulk or foam sealant. Though more expensive, you should also consider hiring a contractor to install insulation in your walls, basement and attic-the results are immediate-a warmer home and a lower energy bill. What is weatherization, and can it make my home healthier and safer for someone with asthma? Weatherization makes your home more efficient, so you use less energy to heat and cool your home, and your appliances use less water and electricity. Weatherization can help make your utility bills lower every month, and can also help make your home healthier and safer. Weatherization can prevent cold and hot, humid from entering your home. Weatherization can also help get rid of mold and moisture in you home, and improve the quality of air inside. All of these improvements can help reduce asthma symptoms for your family. Get Weatherization help in your state. Get more information on the benefits of weatherization. Can the weather outside make my child’s asthma worse? Checking the weather forecast, paying special attention to pollen and ozone levels in the warmer months. Keeping your child indoors on really hot or cold days, and making sure the air in your house is as healthy as it can be. 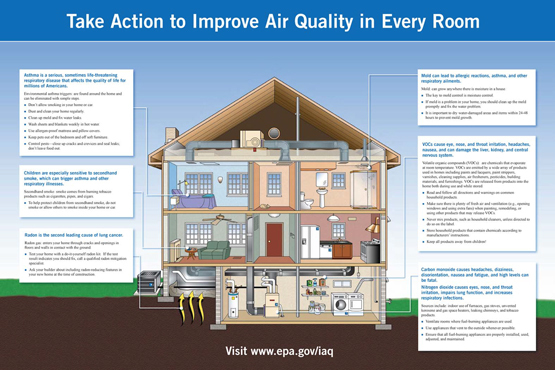 Get more information about indoor air quality here. Making sure your child wears a scarf over his or her nose and mouth when outside during cold weather, to make the air that your child breathes in warmer and less dry. Keep windows closed at night when it's cold outside, and use a humidifier in your child's room at night (be sure to clean it out at least once a week to prevent mold growth). Carry your child's rescue inhaler and spacer with you in case of emergency, and make sure your child has an inhaler and spacer with them at school, and can get to it quickly in case of emergency. Can mold in my home trigger my child’s asthma? What can I do to eliminate mold? Find and fix all water problems (roof and pipe leaks). Look for water stains on ceilings, walls and floors, and fix the cause of the leak. Make sure your home is vented properly, especially in bathrooms, kitchens and basements. These rooms should have fans that vent to the outside of the home. Replace carpeting in kitchens,bathrooms and basements with hard, cleanable floor covering. Clean flooded areas in the home within one day. Mold on surfaces 10 square feet or less can be cleaned with a damp cloth or mop and detergent solution. Mold on surfaces more than 10 square feet should be cleaned by a licensed professional mold remediation company. How can I make sure my home is free from tobacco smoke? Don't smoke inside, and ask visitors and others in your home not to smoke inside your home. When smoking outside, be sure the door and windows of your home are completely closed prevent smoke from drifting inside. Change clothes after smoking, or wear a jacket while smoking that completely covers your clothes and store it separately from other clothes. Seek help to stop smoking. What are dust mites and how can I get rid of them? Wash bedding weekly in hot water. Use dust-proof, or allergen, mattress and pillow covers. Vacuum weekly with a HEPA vacuum cleaner, especially in bedroom areas. Dust furniture weekly with a damp cloth. Reduce sources of moisture to decrease humidity. If I’m pregnant, is my unborn child at risk for lead poisoning? Unborn children can be exposed to lead, which can affect their health and development after birth. If you're pregnant, having high levels of lead in your body also put you at greater risk for having a miscarriage or a baby with a low birth weight. While you're pregnant, ask your provider to test your blood for lead and have your home tested for lead. It can be a good idea to fix lead hazards before your baby is born, but do not make repairs yourself. Make sure you are out of the house when repairs are being made, and that all the dust is cleaned up in your home before you return. How do I prevent or lower an elevated blood lead level in my child? If your kids are picky eaters, give them a children's daily vitamin to help make sure they get the nutrients they need. Serve healthy snacks and help children eat five to six small meals and snacks a day because a child with an empty stomach will take in more lead. Avoid foods that are high in fat and oils -- like butter, lard, bacon, scrapple and deep fried foods like french fries and potato chips -- because they make it easier for the body to absorb and retain lead. Children explore their world by putting things in their mouths. Wash your child's hands before they eat, after they play outside, use the restroom or crawl or play on the floor. Wash their toys often. Frequent hand and toy washing keeps the lead dust from getting into your child's mouth. How can I clean my home to reduce lead dust? Wet clean surfaces using a cleaning solution to reduce lead dust. Clean using a two bucket method - One bucket for hot water and an all-purpose, environmentally safe cleaner (Example: Simple Green), and one for clean hot water for rinsing. You should wear gloves and have a good sponge. Change your rinse water often. When you're done, throw the rinse water down the toilet or laundry sink. Do not throw the water down the kitchen sink that you use to prepare food or down your bathtub it might leave some lead behind that could be harmful. Never dry sweep or dry dust because it stirs up the dust around the house. Use damp cloths to dust and wet mop floors. If you have carpet, use a vacuum with a HEPA filter to prevent the dust from being re-circulated back into the air. Toys should be washed in mild soapy water and rinsed well before children are allowed to play with them. ALWAYS rinse pacifiers, bottles and toys if dropped on the floor. How can I safely perform repairs to my house if it has lead paint? Keep children and pregnant women out of the home or at least prevent family members from having access to the work area until the work is completed. Cover all furniture, belongings, and floors with thick plastic. Wet scrape deteriorated surfaces by misting them before sanding or by using a wet sanding sponge. NEVER dry scrape or dry sand or burn the lead painted surfaces. This will release more hazardous lead into the air and onto the floor and can poison everyone in the home. Dispose of all debris and work materials in sealed, thick plastic bags and remove from the home immediately. HEPA-vacuum and wet clean surfaces in the home to clean up any lead dust after work has been completed. Workers should protect themselves while repairing chipping paint by wearing a respirator and a Tyvek suit. How can repairs be safely done to my home if it contains lead? If the area to be fixed is large or if there are multiple areas that need to be addressed, the best option is to hire a lead certified contractor. A certified contractor will know the proper way to do the work, clean up afterwards and dispose of things safely to minimize the risk of possible exposure to you and your family. Always ask to see credentials to verify the contractor has proper certifications. Children and pregnant women, in particular, should be out of the home when lead paint is disturbed. Other adults should stay out of the area where work is being done and no one should go back into the work area until it has been inspected and has passed a lead dust clearance test. Contractors who perform lead hazard reduction work in homes built before 1978 should use trained workers and lead safe work practices. They are also required to be in compliance with the EPA Renovation, Repair and Painting Rule. You can find information about this rule here. How can I reduce lead hazards in my home? Homes built before 1978 may contain lead-based paint and lead hazards. We recommend that you have your home tested by a certified inspector and use a lead certified contractor to do any work in your home. Call the Green & Healthy Homes Initiative at 800-370-LEAD if you need help identifying a certified inspector or contractor or to locate possible grant funds to help pay for these services. How can I find out if I have lead paint in my house? I assume there is since it was built around the 1930s. An important question, especially if there are young children who live in or regularly visit your home (there are over 500,000 kids poisoned by lead every year in the US). Since your home was built before 1978, there is a good chance it has lead-based paint. The best way to check for lead is to hire a certified Lead Risk Assessor. They will perform an X-ray flourescent test for leaded surfaces as well as test for leaded dust. Lead dust that forms from chipping, peeling or flaking leadbased paint is actually the main pathway for poisoning of young children. One caution, if you see chipping paint (often looks like old alligator skin) do not dry scrape it! To learn safe ways to address lead hazards in your home visit our Lead Hazards page. I’m thinking changing the windows in my bathroom to the kind that open. Would this help reduce mold and mildew? Yes, installing windows that open is a great idea. Fresh air ventilation is really important in places like bathrooms, kitchens, laundry rooms and basements to prevent the growth of mold and mildew. Installing vents with fresh air returns are a great step to a healthier home as well. Could mice and roaches be causing my child’s asthma symptoms? Eliminate all food, water and shelter opportunities for pests in your home. Clutter is an easy way for pests to have hiding spots in your home. Seal any holes in the home the size of a dime or greater. Use copper mesh to fill the hole and apply caulk, foam or concrete to be certain mice and rats cannot chew through it. DON'T USE ROACH SPRAY! To treat your home for roaches use roach baits, boric acid (a thin application) and roach gel as a green and healthy way to get rid of roaches. For pet owners be sure to pick up your pet's food at night and cover it tightly or place it in the refrigerator. How can I keep pollen from increasing the severity of my child’s asthma symptoms? During the spring, pollen can pose a threat to many individuals with asthma or other respiratory conditions. There are several ways to decrease your child's exposure to pollen. Make sure your child takes her/his daily asthma controller inhaler and allergy medications as prescribed. Try to keep windows and doors closed, especially during high pollen days. A great way to keep pollen out of the house is to make sure everyone, more importantly the child with asthma, changes their clothes after coming inside from work and school. It's also a great idea to keep hampers and other laundry baskets in a closet in the bedroom or hallway not directly exposed to sleeping areas. Have children wash their hair at night before going to bed. This helps reduce pollen exposure while sleeping. To check which days will have high pollen counts, check out this great website. Should my landlord have access to information on whether or not my home, which was built in the late 60s, has lead paint? The Residential Lead-Based Paint Hazard Reduction Act of 1992, also known as Title X, is designed to protect families from exposure to lead from paint, dust, and soil. This law requires the disclosure of known information on lead-based paint and lead-based paint hazards before the sale or lease of most housing built before 1978. Please visit the Environmental Protection Agency's website to learn more about the lead disclosure rule for landlords and sellers. For further assistance, e-mail info@ghhi.org to learn more about your rights and protections. Please include the state in which you reside in the e-mail. How do I know if my home has mold? What exactly is a green & healthy home? What steps can I take to transform my home? GHHI uses the U.S. Department of Housing and Urban Development's (HUD) "Seven Tips for Keeping a Healthy Home," plus we've added energy efficiency as the eighth element for a Green & Healthy Home, recognizing that extreme heat and extreme cold have significant impact on the health of the residents in the home. There are many things that you can do to maintain a home that is clean, healthy and energy efficient. Benefits to maintaining green and healthy homes are abundant, but most notably having a green and healthy home will improve the health of residents in the home and decrease medical costs, reduce energy costs, and produce a higher standard of living for your family. How can I prevent asthma attacks? Take the steps to prevent asthma attacks by reducing exposure to mold, dust mites, secondhand smoke and pet dander in your home. For more information on how to manage the home environment to stave off asthma triggers, visit our page dedicated to asthma. What should I know about carbon monoxide in the home? Carbon monoxide (CO) is a poisonous, colorless, odorless, and tasteless gas so it can be very hard to detect. Carbon monoxide poisoning can result in death. Carbon monoxide can be a concern in the home when there is not an effective ventilation system; when furnaces, hot water heaters, space heaters, cooking ranges are not maintained or vented properly; and if there is gasoline-powered equipment at use inside. Test all combustion appliances for high levels of carbon monoxide in the home and install a carbon monoxide alarm in the home. Gasoline powered electric generators should never be run inside the home. Carbon monoxide can be a concern in the home when there is not an effective ventilation system; water heaters, space heaters, cooking ranges are not maintained, and if there are gasoline-powered equipment at use. Air should be tested and maintenance of gasoline powered equipment and appliances should be done in the home. What are some common household allergens? How can I protect my family from being exposed to lead? How do I know if my home has radon? I’m a Maryland resident concerned about possible lead hazards in my building. The landlord is not providing any information. How can I resolve this issue? How can I get keep bugs and rodents out of my home? Clean up spilled food right away and wash dishes and cooking utensils soon after use rather than leaving them in the kitchen sink or on the countertop. What are home health and safety hazards, and how can I prevent them?